Even today, Anita Harris dressed in uniform as 'Nurse Clarke' in the 1968 Carry On movie "Carry On Doctor" remains a fantasy for many red blooded males! It's perhaps a little easier to now forget her early singing career as a chart breaking recording artist or even her numerous TV appearances as an actress, singer and dancer. Anita has certainly shown herself to be multi-talented and has done so since a very early age. Anita's musical career began as a child although her expectation was to become a dancer. Soon after leaving school she left the UK to train as a choreographed skater in Las Vegas. Even today this would be unusual, but in the 1950s it was an exceptional experience and gives some idea of the kind of expectation held by her family. However, her first significant professional engagement in the UK was as a singer- briefly as one of the few ladies to sing with the Cliff Adams Singers. These were choralists who were to enjoy an astonishingly long run with BBC radio's "Sing Something Simple". She was still in her teens when invited to cut her first recording- with the John Barry Seven- a band who at that time were at the most active part of their own pop chart career. This early single did not succeed as hoped and it was a few years before Anita tried again. The late 1960s saw her career at its peak. Besides her important hit "Just Loving You" -acquired through her friend Dusty Springfield from brother Tom- she also made appearances in several British movies and had a very popular presence on UK television. She made a most successful appearance at the San Remo Song Festival in Italy- something that perhaps one associates with more established stars like Petula Clark. In fact, at the time of writing she still shares the same musical arranger as Petula- Kenny Clayton. By the time that Anita reached the peak of her singing career, the fashion for EP releases was beginning to fade. However, there are at least three that I am aware of and the one on the right (CBS EP6401) is probably the easiest to find. The pace of her career slowed somewhat during subsequent decades, and film appearances have been rare. However, Anita has maintained a steady presence in cabaret and stage. Her singing skills have, until recently, been employed more frequently in pantomime and stage musicals rather than on records, but she is still recording and still in excellent voice. 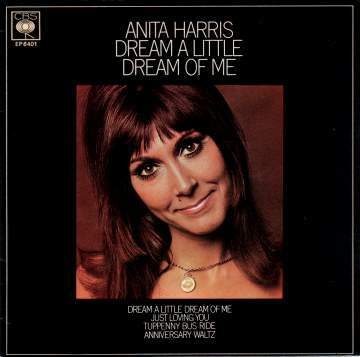 Pye NEP24288 1967 "Anita Harris"
CBS EP6359 1967 "Nursery Rhymes For Our Times"
CBS EP6401 1968 "Dream A Little Dream Of Me"